Soundflower presents itself as one of two audio devices (2ch / 16ch). The 2-channel device is sufficient for most situations. To send the output of one application to another, select Soundflower as the output device in the first application and Soundflower as the input device within the second application. If an application does not allow you to specify audio devices, you can make Soundflower the default input or output device inside the Sound panel in the System Preferences, or with the Audio MIDI Setup utility application. The 16-channel device is provided for more complex routing situations, and can be used with more than two applications simultaneously if the applications support audio routing to any channel, as Max/MSP does. Note that Soundflower’s audio channels represent a global audio space. If more than one application is sending its output to the same channel, the audio will be mixed. 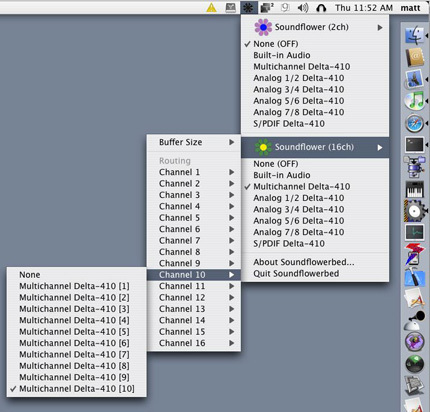 If you want an application to send and receive audio through Soundflower, (for instance using Max/MSP to manipulate and return another application’s audio) you must send and receive the audio on different audio channels or a feedback loop will be created. If you are hearing clicks or breakups, try increasing the buffer size of both applications (set within each application). Since Soundflower offers a straight forward method of communicating between applications on the Mac, there are a variety of situations where you can employ it. Soundflower has been used extensively in podcasting by combining separate streams of audio into one source. Instead of recording an interview with Skype and only hearing one voice, Soundflower lets you publish both voices for a complete interview experience. Use an application called DittyBot and Skype to access your iTunes collection from any cellphone. Record streaming audio from iTunes into Audacity, or route an audio stream from iTunes to Logic. When using Soundflower to send audio to and from applications, you may find that you are not able to send audio through another device to monitor audio output. In such situations you can use Soundflowerbed, an application that resides in the Finder’s Menubar allowing you to tap into Soundflower channels and route them to an audio device. Soundflower 1.5.1 requires Mac OS 10.5. Soundflower 1.4.3 requires Mac OS 10.4. Soundflower 1.3.1 requires Mac OS 10.2.8 or later. Copyright © 2004-2019 Syntheway Virtual Musical Instruments.